Born in Floresville, Texas, Connally pursued a legal career after graduating from the University of Texas at Austin. During World War II, he served on the staff of James Forrestal and Dwight D. Eisenhower before transferring to the Asiatic-Pacific Theater. After the war, he became an aide to Senator Lyndon B. Johnson. When Johnson assumed the vice presidency in 1961, he convinced President John F. Kennedy to appoint Connally to the position of United States Secretary of the Navy. Connally left the Kennedy Administration in December 1961 to run for Governor of Texas, and he held that position from 1963 to 1969. 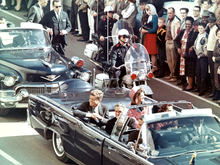 In 1963, Connally was riding in the presidential limousine during Kennedy's assassination, and was seriously wounded. During his governorship, he was a conservative Democrat.